ICH Blog: The birch brooms of Samuel R. Spencer, Cul de Sac West. The birch brooms of Samuel R. Spencer, Cul de Sac West. One of my current folklore obsessions is the traditional Newfoundland birch broom. I've written about birch brooms on this blog before, and you can read about what a birch broom is (and see a video of Mr. Joshua Young making one) here, and more photos of the process here. If you are so inclined, you can also read an article I wrote called "Street Arabs, Drain Sweepers, and Birch Brooms." The birch broom picture above belongs to Janet Edmonds of St. John's, and was made by her maternal grandfather, Samuel Robert "Young Sam" Spencer (1920-2001), originally of Cul de Sac West, a now-resettled community just east of Cape la Hune on Newfoundland's south coast. Photo of Samuel R. Spencer, courtesy Janet Edmonds. "Young Sam" shows up on the 1921 Census for Burgeo & LaPoile District - Cul de Sac West, the son of "Old Sam" Spencer (born 1879). He show up again in the 1935 Census for the same district. He later moved to Channel-Port aux Basques, and is buried in the St. James' Anglican Church Cemetery, Barachois Hill, Port aux Basques. 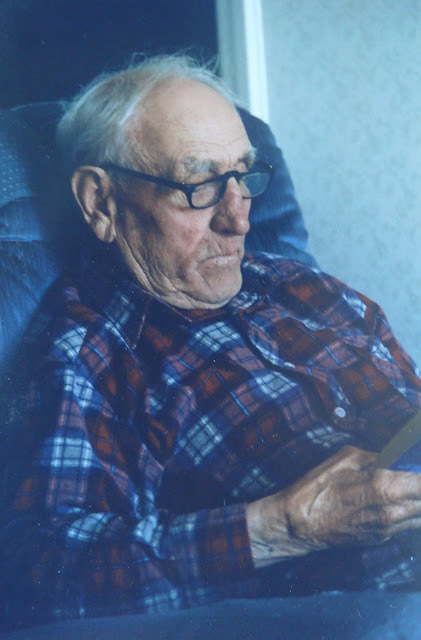 A few years before his death, he made a batch of birch brooms for family members and grandchildren, including one for Janet and one for her sister. Janet tells me that he was a bit of a craftsman, and liked to putter around making things, including a long-handled "pooper-scooper" so he wouldn't have to bend over while walking the dog. Mr. Spencer's birch brooms are very similar in style to those made by Joshua Young, who grew up in Grey River, only a short boat ride (20km or so) from Cul de Sac. The major difference between the two makers is that Spencer's brooms are tied off with wire, rather than the cord used by Young. Do you have a birch broom with a story? I want to hear it! I'd also love to track down some living birch broom makers. If you have ideas or memories, comment below, or email me at ich@heritagefoundation.ca. That's my Dad. I have some of his brooms and through watching him I learned to make my own.I haven't made one in a while, but at least I learned how before the knowledge was lost.I now wish I had paid more attention.